Our May South Shore Mixer will take place on Wednesday, May 8th from 5:30 - 8:30pm at Lake Tahoe AleWorX at their Stateline location! All attendees will receive one free drink and appetizers. As usual, TRYP members are FREE and non-members are only $10. Not a member? 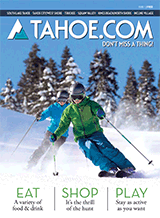 You can sign up at any of our events or on our website at www.TahoeTRYP.org for only $45 per year!